The biggest selling points of the Dungeon Crawl Classics RPG aren’t just its old school vibe, easy-to-learn mechanics, and gonzo play style – it’s the art, which visually embodies all of these qualities in spades. 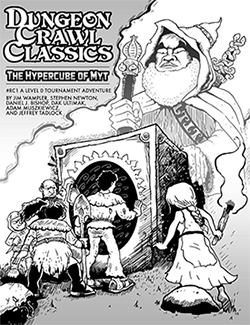 Tonight, we’re privileged to talk with one of the primary architects of the visuals for the DCC RPG world and the voice of DCC himself, Doug Kovacs. Excellent! I’ve been jonesing for the podcast for since the last one posted. I’ve really been enjoying these (and hope you will continue to enjoy doing them, as well). I can’t believe my e-mail made the podcast and you sent it to the “Dark Master” himself who in turn sent it to Doug Kovaks…that is so unbelievably awesome! And Jim you are right to fear my polar vortex spell. Keep up the great work! I got to grab my sling shot and get to work…. It always seems funny to me anyone would call Joe the “Dark Master”. If you ever meet him in person you will understand why. Overall, great podcast once more. Oh, one more thing. Dungeon Denizens. You should get Doug to draw up a unique beast, post it, and then ask for stats. Best 3 sets of stats get published. I never noticed before this show, but Doug sounds kind of like Bender. A more laid back Bender. Daniel Bishop, great idea! I’d love to participate in this contest!!! Doug, you have to consider such a cool idea! And, I’d like to know what was on the music mix you gave to Joseph? Awesome episode. Doug was a fantastic guest. You guys should definitely have him on again sometime. I always thought the symbol was a 7 and a 6 smashed together. I never bothered to look it up but I thought that maybe it was the year Doug was born. Great show! I check every day to see if a new one has been posted. I loved the part where Doug was talking about how the art told a story in the modules. Jobe told me to send you the bill Daniel. Yeah, well, Jobe says a lot of things….. Fantastic! I’m working on an entry! Thanks for another great podcast! Looking forward to the next one. Keep em coming! I guess it’s official now…we don’t get another Spellburn podcast until I admit I’m jonesing for one. More! I need more Spellburn! Great Episode, need more Spellburn. When comes the new Episode? We miss you guys. Hope all is well. Uh oh, is spellburn dead? We aren’t dead. We are just too busy to record. It will probably be another 2 weeks before we have time to do one. Thanks for the Information. Waiting for another great show. Damn you, Doug Kovacs! Your awesomeness broke the show! So, is this thing over? That would be sad. Show isn’t over but no one can record until April. That’s how busy we all are. Sorry everyone. Awesome podcast. LOVED the Kovacs episode. Been a while…are there going to be more? Waiting for Spellburn hurts worse than waiting for Season 4 Game of Thrones.